Goat Heads, But No Goats, Yet. Rabbits and ducklings and goat (heads), oh my. Here’s an update on the goings on at Miles Away Farm. Seriously, could we be any cuter? The three turkeys (Bourbon Red’s – heritage breed – same species Barbara Kingsolver raised in Animal, Vegetable, Miracle) and 16 Ancona ducklings (they sent one extra) arrived last Wednesday. I bought them from Strombergs, and they mailed them out Monday morning from Minnesota. The Post Office called me about 9:00 am Wednesday morning to say “come get them”. They were all fine, and hungry, and seemingly none the worse for wear, which never ceases to amaze me. I decided on Ancona’s after reading Carol Deppe’s book “The Resilient Gardener“, which I recommend. They are also a heritage breed. Ancona’s are calmer and quieter than a lot of other breeds, and they lay a lot of eggs. I’m in it mostly for the eggs (though I’m not opposed to eating a duck now and then). Duck eggs are prized by bakers, and I’m hoping to entice a local bakery to buy them from me. I’ll sell them at Farmer’s Markets too, of course. The individuals of the breed are also uniquely marked, so you can tell them apart. We’ve decided to give them all food names. So far we have Calabacitas (Cali for short), Cheese Cake (it has a black mark under its eye on its cheek that makes it especially cute, like it’s posing for a pin-up calendar), and Cracker (the only one that is almost all yellow). Thirteen more to go. 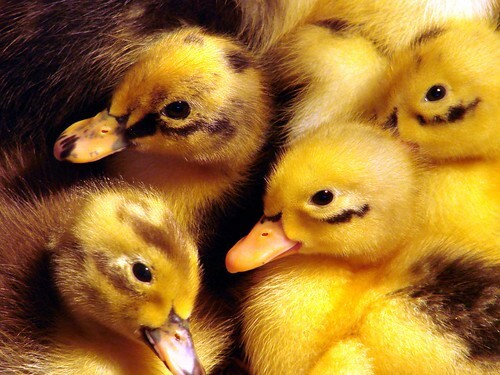 I learned in Carol’s book that if you expose ducklings to water when they are two or three days old, it will activate their oil gland, helping them waterproof themselves so that they can go out and forage in damp grass earlier without getting water-logged. Otherwise, the oil gland doesn’t activate until they are about 8 weeks old. I gave them each a warm (70+ degree) bath/swim for a few minutes on Friday. Since they were born on Sunday or Monday, this may have been too late. But it sure was fun. 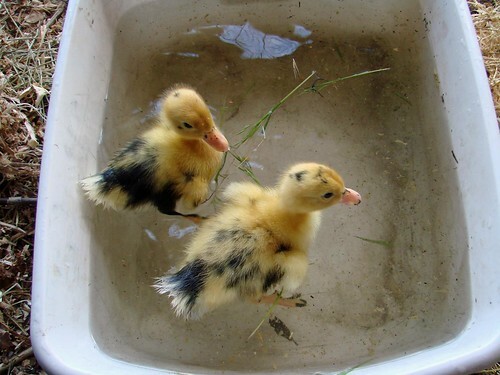 They would freak out for a bit, and then float around, their little feet going as fast as they could, slowly coming to understand “hey, wait a minute…I’m a duck…this feels pretty good”. What I’ve noticed so far is that ducks are more resilient than chickens when they are small. They are more aware, more active, less in need of a super warm brooder and more messy (I didn’t think that was possible, but because ducks need water to be able to eat their duck chow, they manage to get water all over the place. And their poops are a lot more liquidy – and so messier as well). I plan on getting them out of the stock tank brooder I have them in in about another week. Then I will pen them into a horse stall, with lots of bedding and a brood lamp in the corner, and they can run around and make all the mess they want. I’m feeding them chicken starter, but with extra niacin in the water (100 mg of people niacin dissolved into a gallon of water) as they have a higher need for niacin for the first two weeks. The turkeys are on game bird starter, which has much higher protein than chick starter. Evidently, if they don’t get enough protein, they have serious leg problems. They are less afraid of me than the ducks, and kind of stumble around their stock tank being surprised when they find the water or the food. Evidently they don’t have very good distance eye sight. This is an experiment. I’m not actually expecting to break even on these guys (heritage breeds grow much more slowly than the white or bronze breasted birds) and it takes a lot of feed (which is more expensive than chick feed) and a long time to get them to a harvest weight. Mostly, I’ve just always gotten a huge kick out of turkeys and wanted to have a few around. Well, it’s gotten warm enough that the Puncture Vine (i.e. Goat Head weed) has germinated out in our perennial garden. I knew it was out there because the dogs kept getting into it, and I kept getting stabbed when I was planting the strawberries. Well, boy do we have it. Holy Ground Cover Batman. 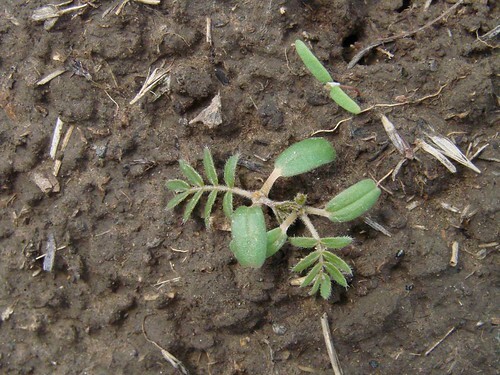 It’s an annual, and easy to kill with a rake or a hoe when it is small. I evidently chose a former bed of it to plant the strawberries in. 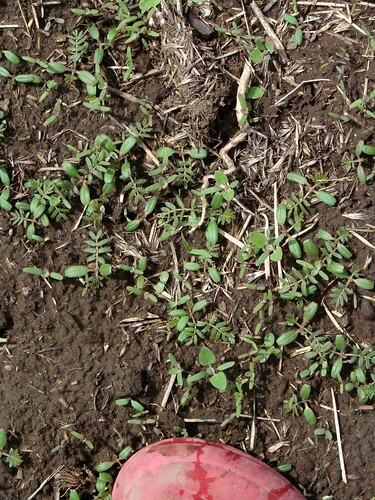 I hope it all germinates this year and we can be done with it. We’re certainly not going to allow any of it to go to seed. 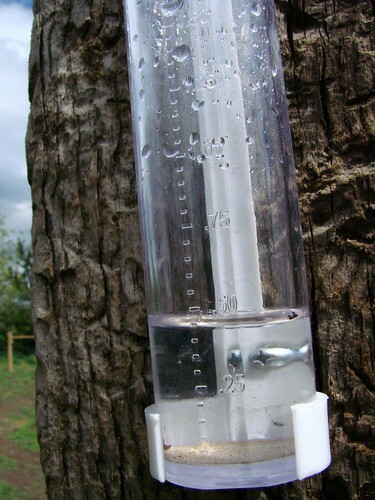 I remember this stuff from California and Arizona, where it will go right through a bike tire, or a flip flop. Ouch. A single seedling, already putting on growth. Note the tip of my shoe in this picture for scale. That's a lot of puncture vine! No doubt the puncture vine germination is a mix of soil temperature and the nice amount of rain we've been having lately. We got the rabbit cages up off of the saw horses. It will be so much easier to clean under them. And the saw horses we had them on were already getting gross from just a week of bunny exposure. 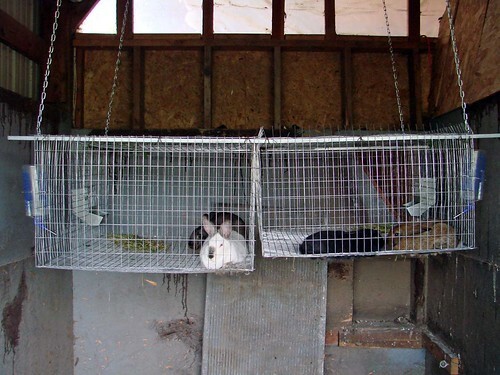 I know this wire cage looks sterile and cold, but the rabbits don’t seem to care. They lounge around and eat and drink and keep each other company. And because of how the cages are hung, they sway a bit, kind of like a hammock. A nice perk when you are eating your hay or fresh grass/clover. I saw the two adults grooming each other this morning, so evidently, they are buddies. The young ones are visibly gaining weight, so that is good news. I was worried that they weren’t old enough to be weened, but they seem to be doing fine. I’m planning on building a rabbit tractor (i.e. pasture cage) so that during the summer, I can get them out onto green grass and clover. I’ve read that giving a rabbit too much grass/clover or giving it to them too young can cause diarrhea. And I thought, wow, it’s come to this. We’ve breed an animal to the point where it can’t eat its natural food without getting sick! So instead you have to BUY its food, already processed. Brilliant! But I figure it’s like any animal that relies on the bacteria in its gut to be able to digest. If you change diets, you have to give the bacteria time to readjust. So I’m giving both the young ones and the older ones some greens from the pasture every day (the young ones less). And all are doing fine. No sign of diarrhea. 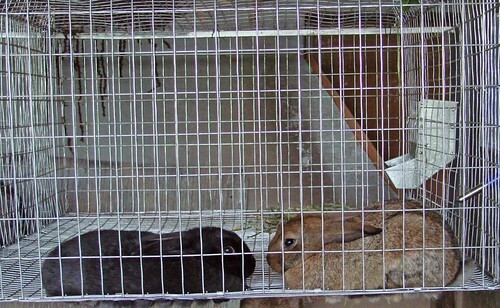 Polyface Farm has been raising rabbits on pasture for many years. It can be done. Back a few months ago now, I bought a used fridge and freezer off of Craig’s List. The owner of the house had passed away suddenly. A family friend was helping get things cleaned up. As I looked around the back yard (the appliances were on the back porch) I saw ceramic pot after ceramic pot. So I asked, “Was the owner a gardener? I’m a gardener too. What’s going to happen to all of these pots?” Several months later, I made a deal to buy all of the pots, which turned out to be about 90! 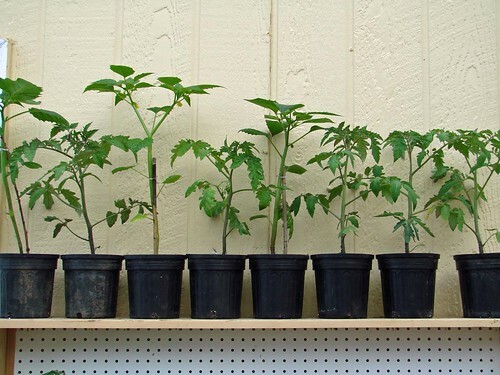 All but about 10 are pots I would have purchased myself, given the chance and the disposable income. Those I don’t use myself I’ll plant with flowers and sell at next year’s farmer’s markets (too late this year to plan for it). I’ll call them Rosemary’s Pots, after their original owner. Along with the wonderful pots, I also picked up 86 used canning jars for about .25 each. Almost all were unchipped, and since I store bulk items like wheat bran and beans in glass jars, those that can’t be used for canning will be used for storage. And all because I also asked about canning jars to the same family friend who was selling the pots (I think the canning jars belonged to HER mother, who had also passed away). It never hurts to ask, and it feels good to be honoring fellow gardeners and canners by using and appreciating the things they loved. One of "Rosemary's Pots". This was one of the few that was cracked, but I don't really care. 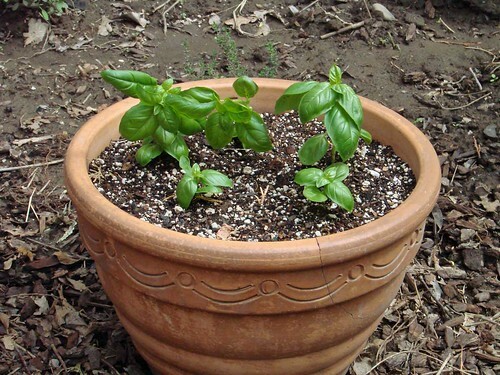 It will grow basil in my herb garden just fine. We discovered that one of the unidentified trees in the back yard is probably a mulberry. 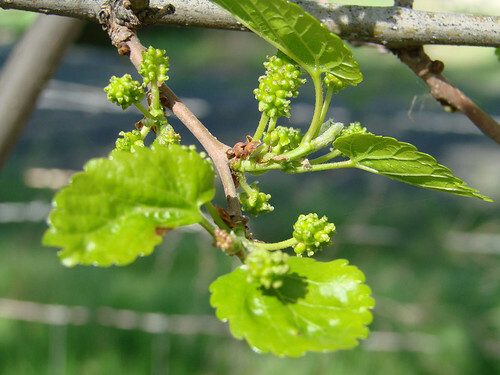 Mulberry comes in male and female trees, which means we’ll need a male tree if we want fruit (which I do). No doubt it was planted by a bird, as it’s not been very well cared for (odd shape, lots of crossed branches). There are a few more seedlings coming up in the lilac hedge. Hopefully one is male. Or maybe I’ll just start my own silk worm farm. Silk worms are traditionally fed mulberry leaves. 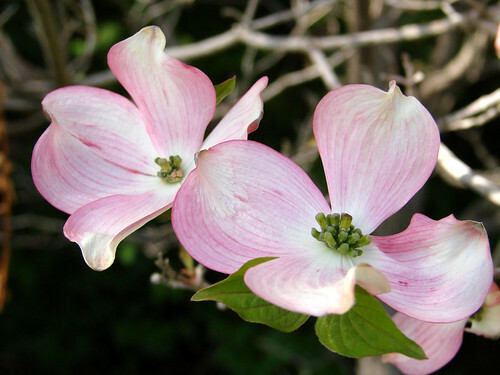 The lone dogwood in the yard is blooming. Stunning. ‘Nuff said. My tomatoes (all 60 some of them) are doing well. These are the largest. I’ve been leaving them outside because I’ve run out of room under the grow lights and the weather hasn’t been too cold. We’ve had to bring them in on windy/rainy nights. Now, if I could just stop accidentally breaking off the tomatillo plants, I’d be happy. I’ve done it THREE times. Argggg! But it turns out if you put the broken off part in a vase of water, it will root, and you can replant it. Perhaps I’m on to something here? 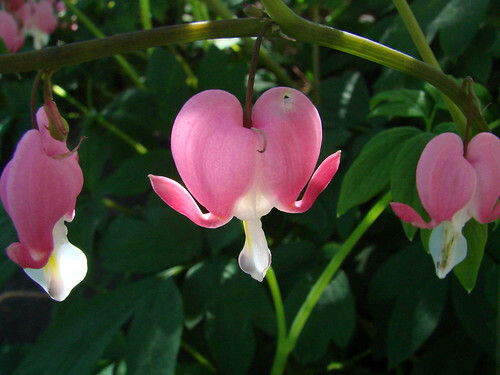 I have wanted a Bleeding Heart plant for going on 10 years now, so I ordered some for myself when I was ordering strawberry plants. Turns out there are about 10 of them here already. More for me. I’m not sad. They are so darned fun! Miles Away Farm Blog © 2012, where we’re miles away from killing all of the puncture vine, but we really are planning on getting goats, perhaps as soon as next week. May your heart not bleed, but instead swell with gratitude this week. Really enjoyed reading this post and finding out about all your animals. I used to keep silk worms as my mum was a primary school teacher and wanted to show her kids their life cycle. At weekends I would look after them. We didn’t have mulberry trees near us, so we used hawthorn and oak and they got on fine.